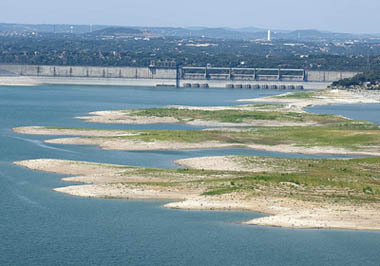 Think the Texas drought is over? Maybe not… History shows that drought is part of Texas’ normal water cycle. Don’t let the recent rains and full reservoirs lull us into complacency! Wise water conservation habits help people and wildlife in times of plenty and in drought! We've developed this Drought Survival Kit as your online resource. Fix faucet leaks, which can waste up to 3,000 gallons of water a year. Get more tips at www.takecareoftexas.org. Water only when plants look like they need it. Most plants die from over-watering, not under-watering. 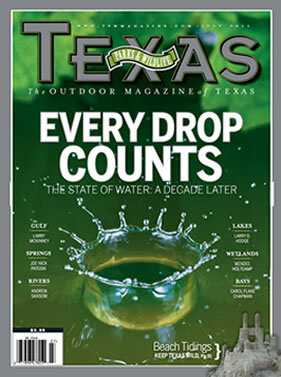 Get more tips at www.texaswatersmart.com. Plant native plants to attract wildlife. Get more tips on helping wildlife during a drought. 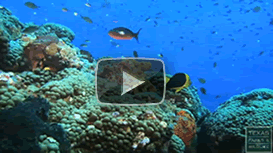 Texas Parks and Wildlife's one-hour documentary explores the rich diversity of the Gulf's unique ecology, diverse flora and fauna and important habitats. Find everything you need to start the conversation in your community or organization. 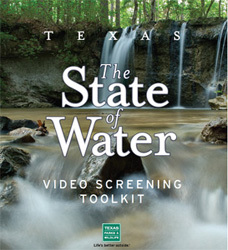 It is simple to host a State of Water video screening! Our Screening Toolkit provides all the instructions and some of the necessary items to make your video screening a success. Donate to any site, program or initiative of the Texas Parks and Wildlife Department, including causes based on this documentary. Content of this site © TPWD unless otherwise noted.